Okay, now you're at the right place at the right time. Actually you probably were yesterday too but I messed the timing up. I also messed up and gave you November's block in October so in November you're getting October's block. Are you as confused as I am. And I'm your fearless leader Queen! How about here's the block you're making this month. Let's get started with the cutting. 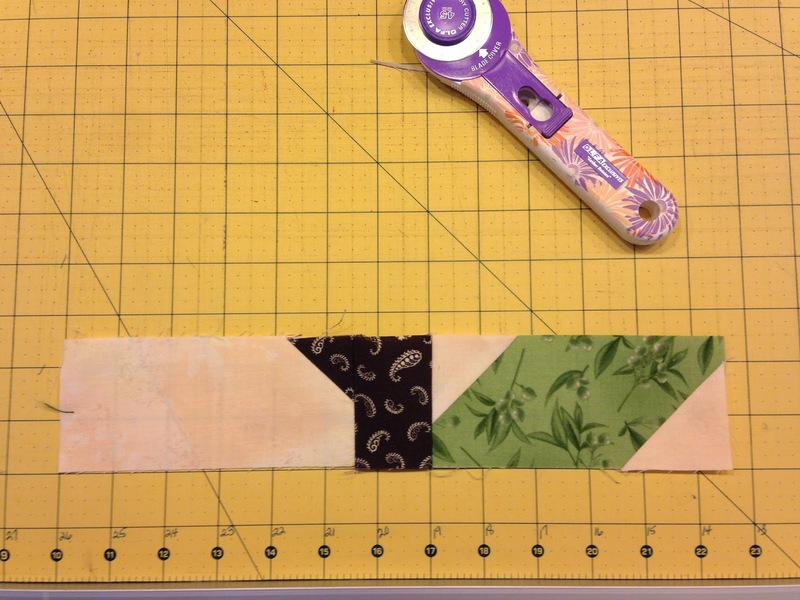 Begin by making 4 half square triangles. 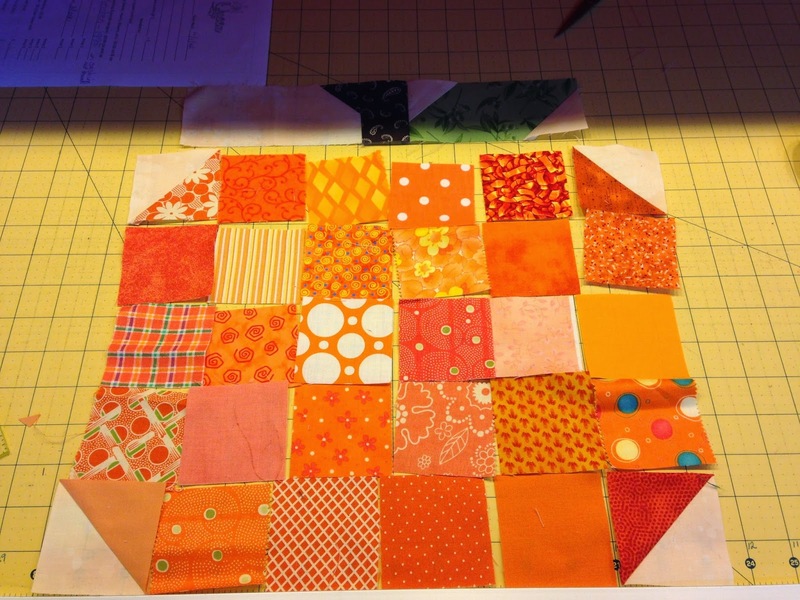 Pair a 3" orange square with a 3" background square. Draw a diagonal line on the background square. 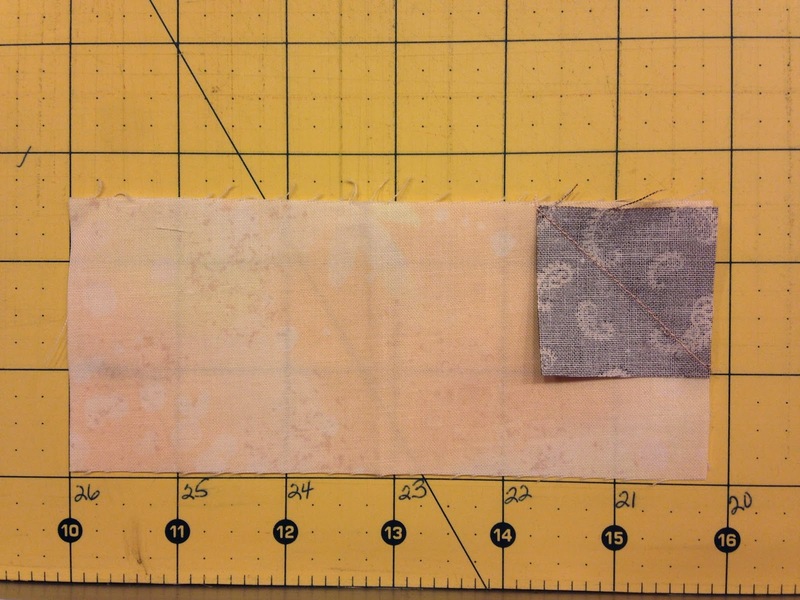 Sew 1/4" from the drawn diagonal line on each side. Cut apart on the diagonal line. Press to the orange triangle. Square it to 2 1/2". You will have an extra half square triangle from each pair that you can stash in your orphan blocks or just throw away. If you need directions on how to make half square triangles, see one of the previous post here. 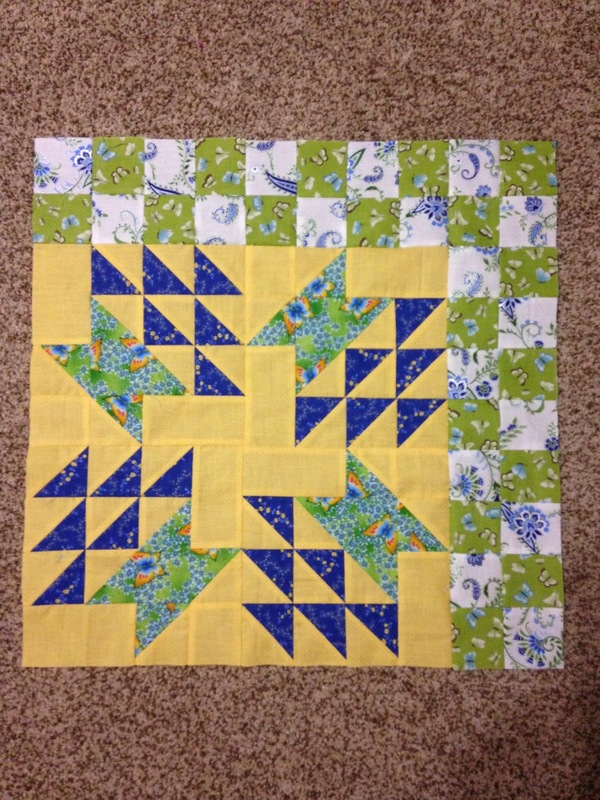 Set your half square triangles aside for now. Now work on the leaf. 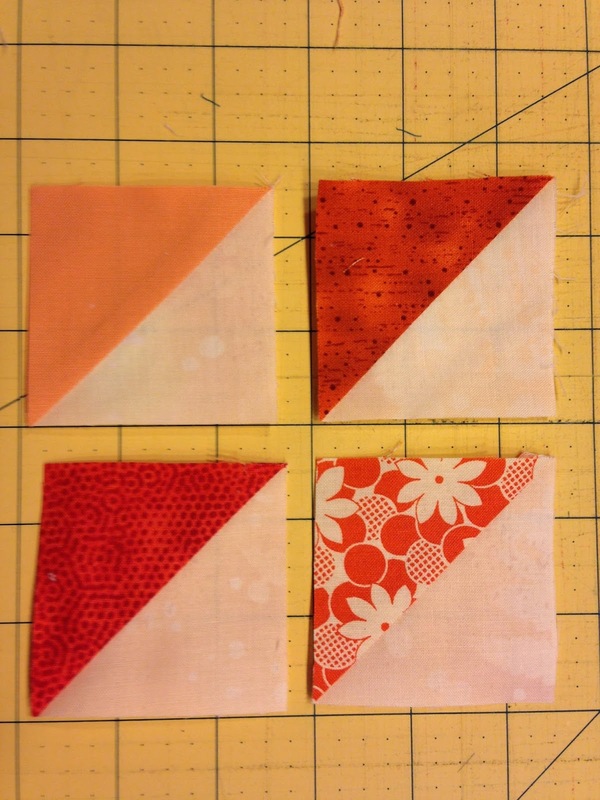 Draw a diagonal line on each of the backs of the 2" background squares. Place them on the green rectangle in the upper left and lower right corners as shown. Sew on the drawn line. Trim off the excess and press towards the triangle. Now work on the stem. 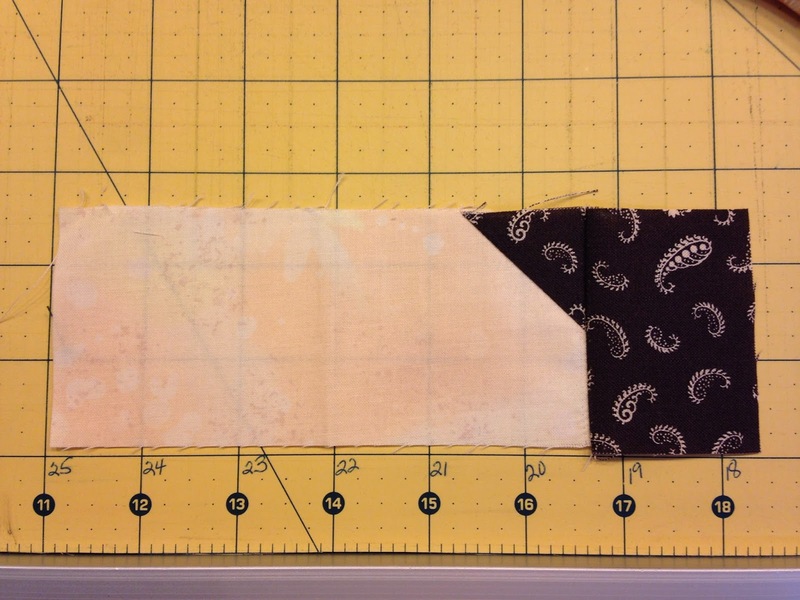 Draw a diagonal line on the brown 1 1/2" square. Place the brown 1 1/2" square on the background rectangle in the upper right corner. 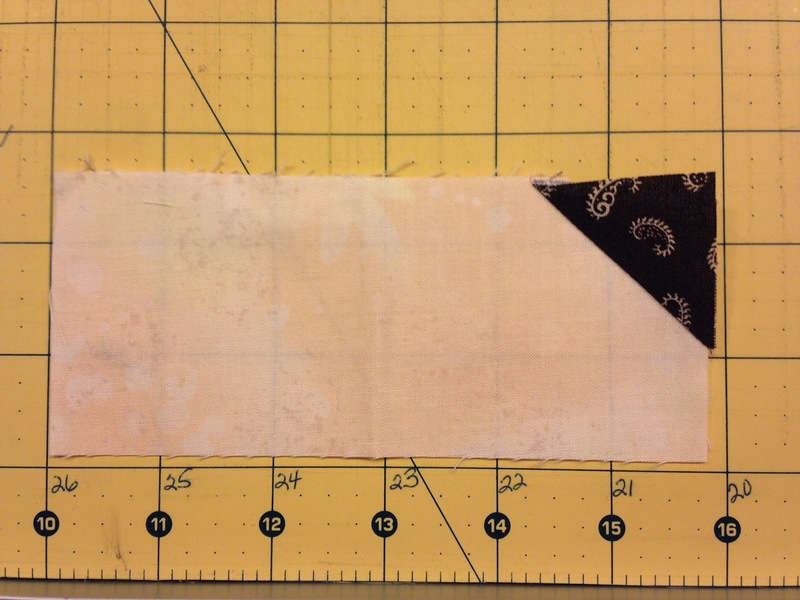 Sew on the drawn line, trim off excess and press to the triangle. Sew the 2" x 2 1/2" brown rectangle to the right side of the unit made above. Now sew the stem unit and the leaf unit together as shown below. The unit should measure 2 1/2" x 12 1/2" unfinished. You're ready to lay your scrappy pumpkin out. 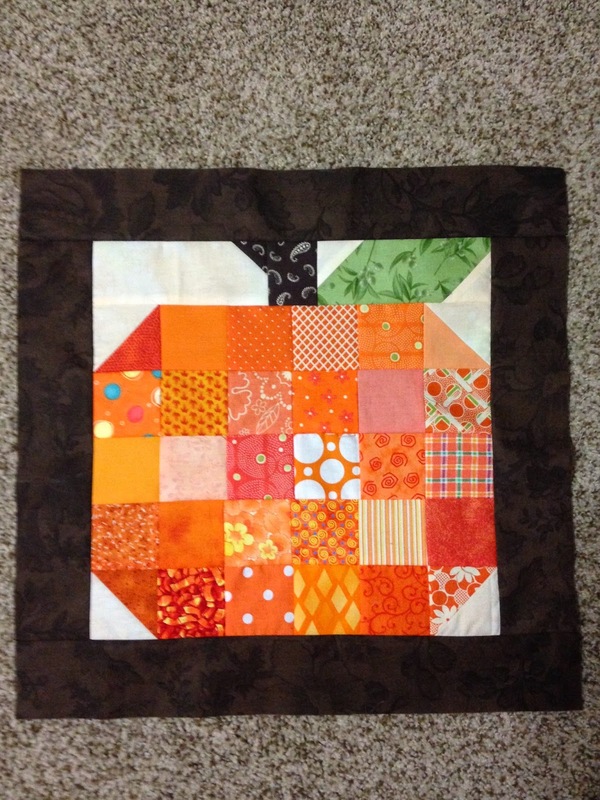 Using the 26 2 1/2" squares and the 4 half square triangles made above, lay the pumpkin out as shown below. 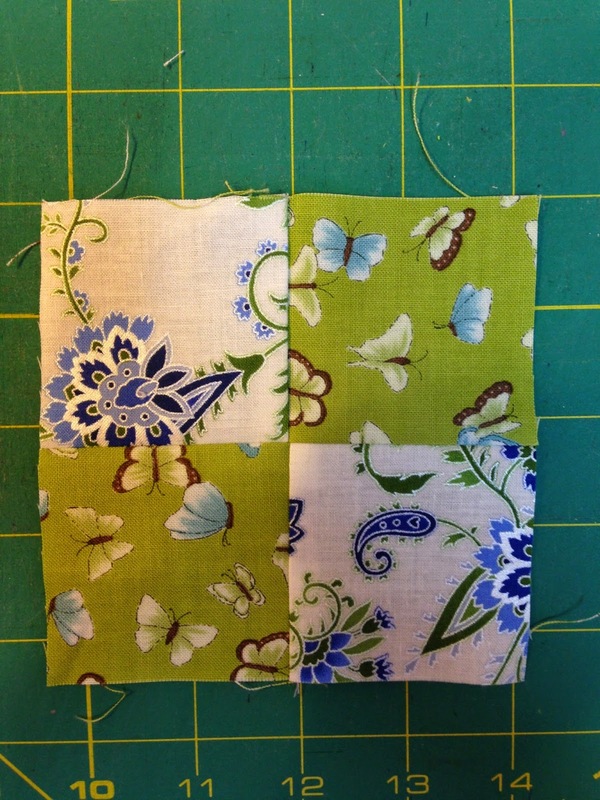 Sew the 6 squares together to make a row. Then sew the rows together including the stem/leaf row made above. Ta Da! You're finished pumpkin. You're not quite finished with the block yet though. 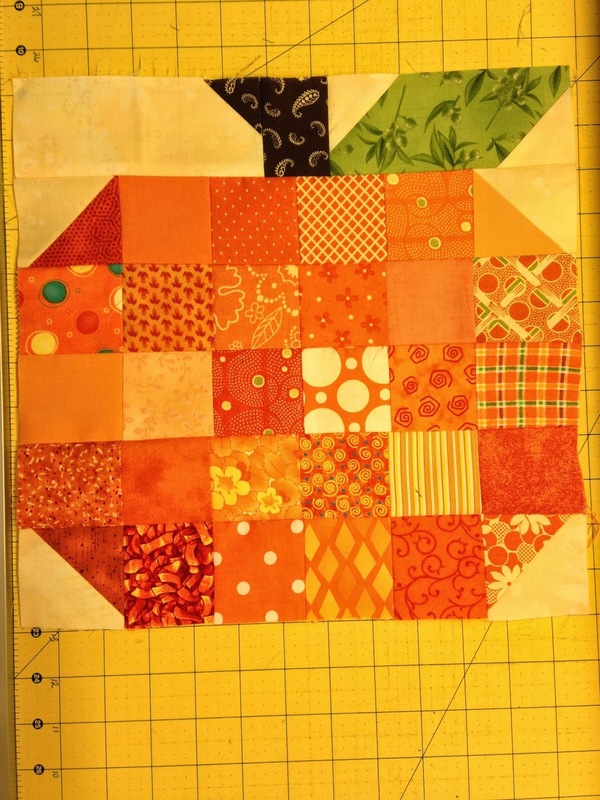 Sew the 2 1/2" x 12 1/2" strips to the top and bottom of the pumpkin. 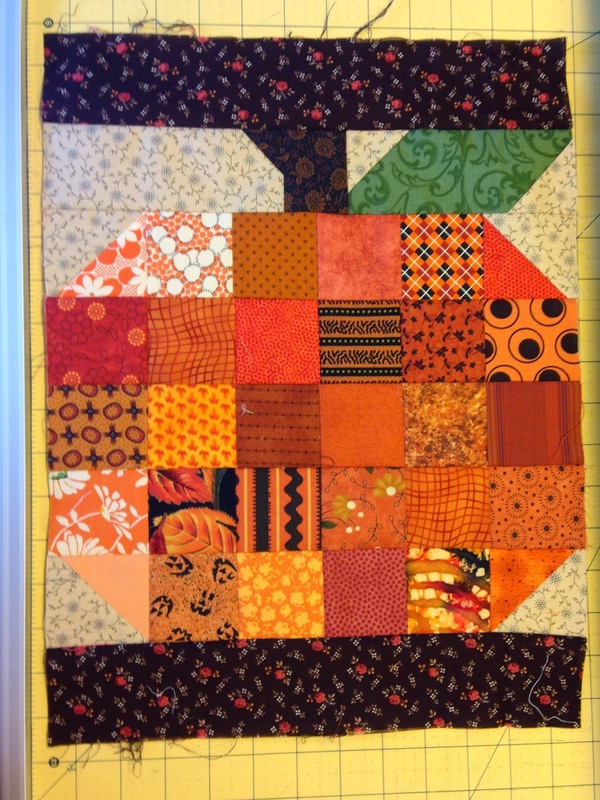 And sew the 2 1/2" x 16 1/2" strips to the sides of the pumpkin. Okay, now you're finished with the block. Now, for a little housekeeping on some of the previous blocks. I was going to have you do this at the very end but decided since this month's block was so quick and easy, that now might be a good time to do this. First up we need to add some 4" checkerboard blocks to the top and side of the baskets we made in May (I think that's when we made them). I made my out of scraps but you will need a total of 18 2 1/2" squares of each of the two fabrics. I sewed mine in a strip set like this. Then I sub cut them into 2 1/2" segments, for a total of 18 segments. 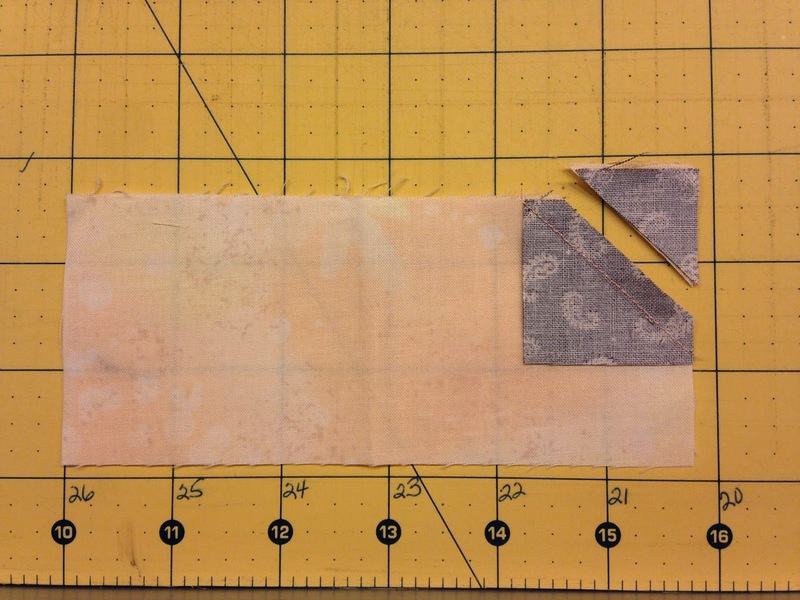 Sew two segments together to make a 4 patch unit that measures 4 1/2" square unfinished. You will need a total of 8 four patch units and you will have 2 segments left over. You will need the leftover segments to make the corner come together as I'll explain below. 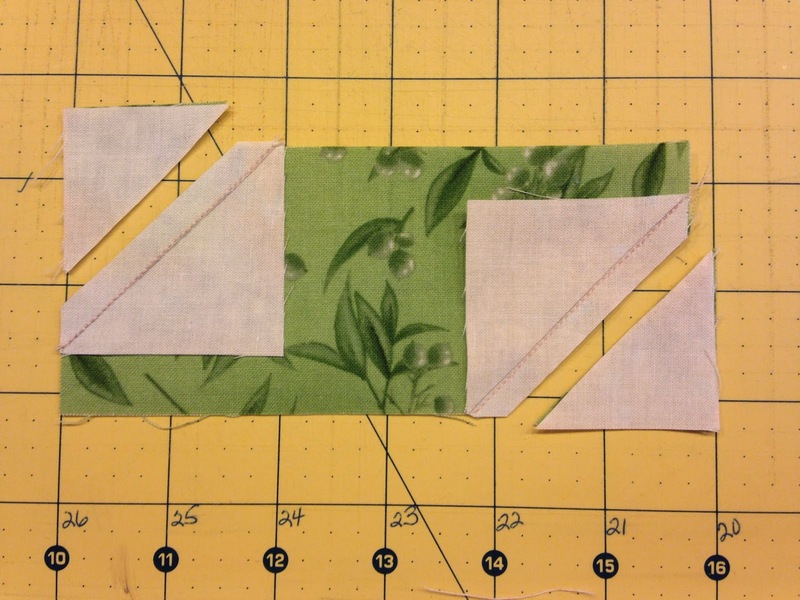 Sew 4 four patch units together in a strip set. You will make 2 of these. 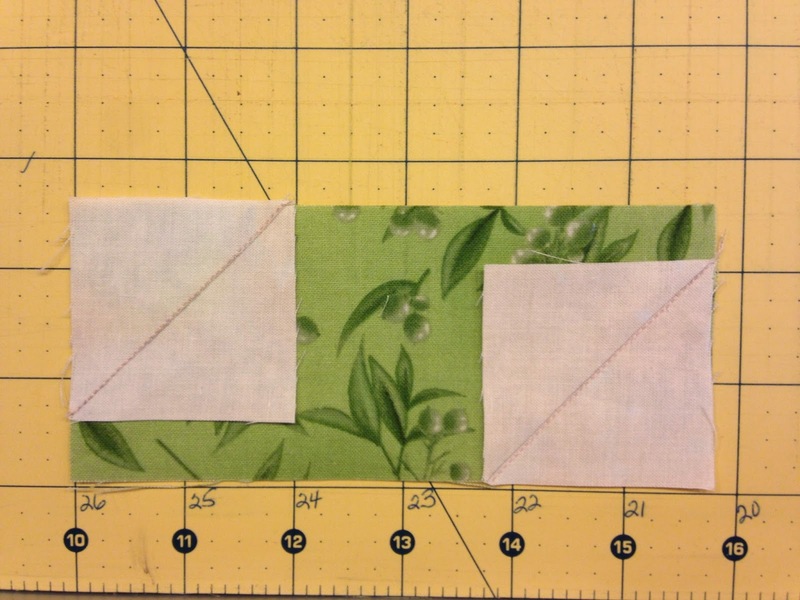 Now sew a leftover 2 1/2" x 4 1/2" segment to each end of one of the strip sets made above. Sew the 4-four patch unit to the top of the baskets and sew the 4-four patch unit plus the added segments to the side of the baskets. 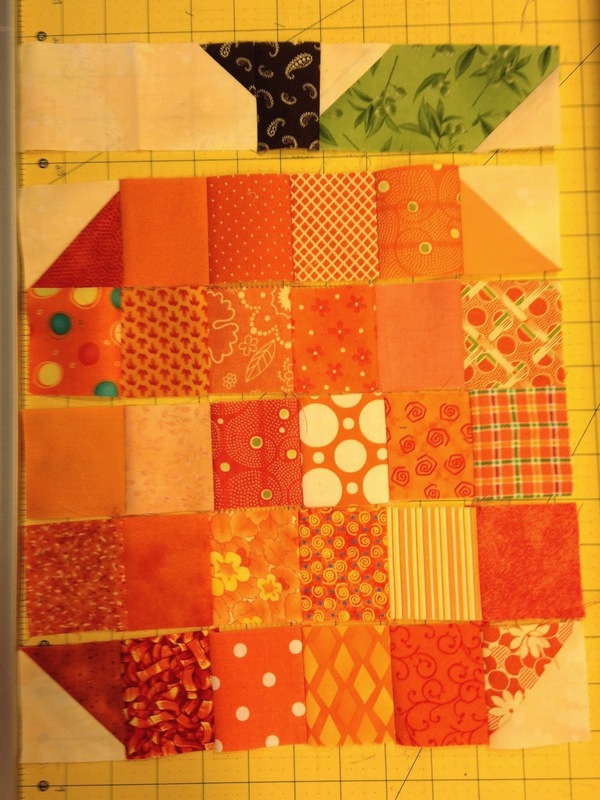 Next up for housekeeping is the February and March blocks. 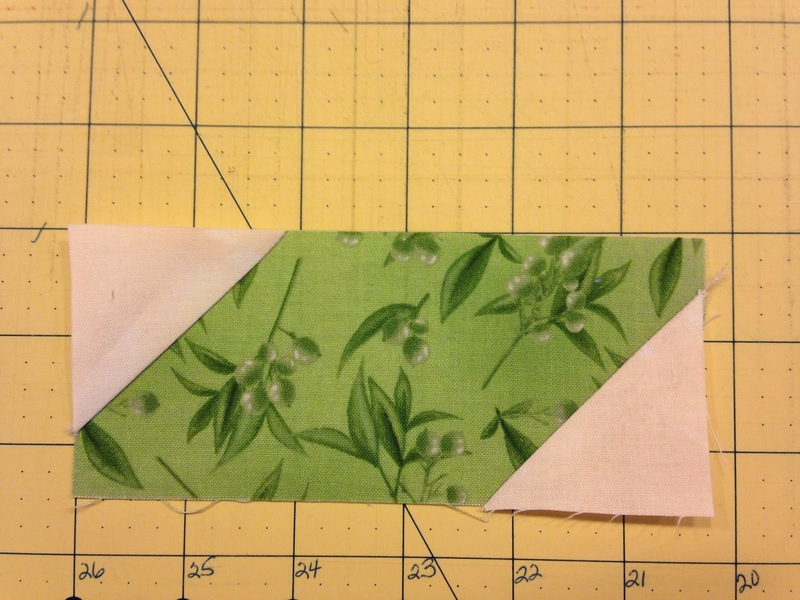 You will need to sew a 2 1/2" x 12 1/2" strip to the right side of the shamrock block made in March. 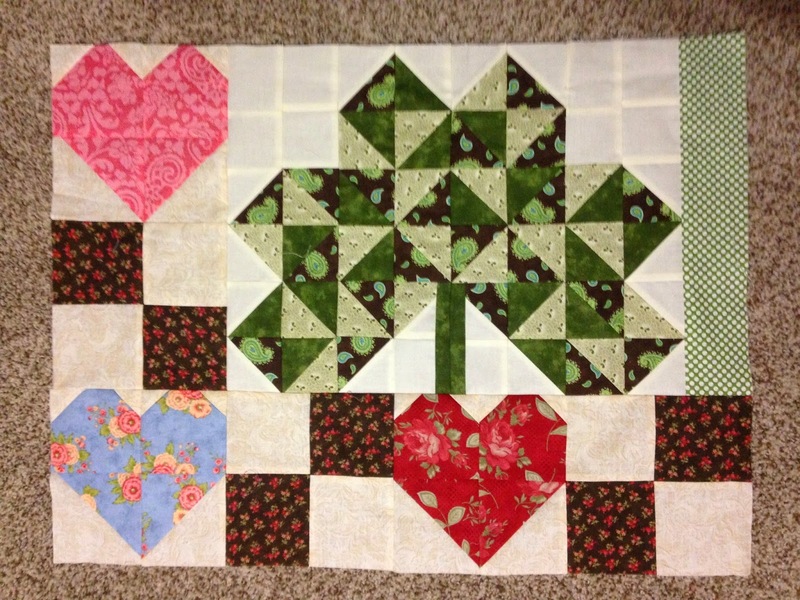 Sew the heart and 4 patch unit to the left side of the shamrock. Then sew the 2 hearts and 2 four patch units to the bottom. Are you still making flying geese? You will need a total of 90 flying geese units. Now go check out the Twas the Night Blog tomorrow and get ready to make some Christmas gifts or be inspired to make some Christmas gifts. 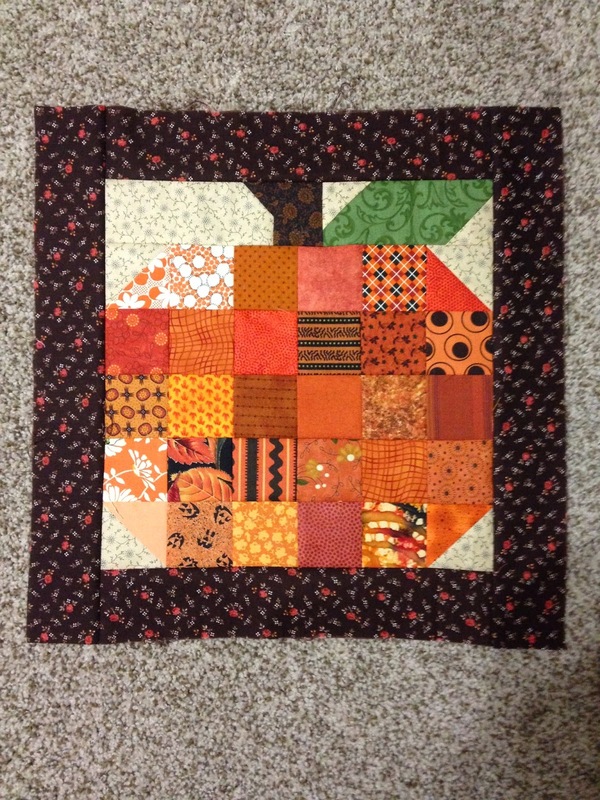 Thanks for sharing your fab pumpkin block, Doris. Am pinning for future reference. Hope you don't mind.